Blu-ray sales slipped further despite the release of First Man. While the film topped the charts this week, it was a disappointment at the box office, and so could not really help lift Blu-ray sales. The problem is made worse by the fact that the next new release was all the way down to 12th. That new release was The Hate U Give. American Renegades didn't sell enough copies on Blu-ray to make it to the top 20 but got as high as 16th on the combined Blu-ray and DVD chart. This week's Ultra HD Blu-ray report: Both 'First Man' and 'The Hate U Give' were available on UHD. 8 titles out of this week's top 10 had UHD editions. 'First Man' had a first week BD sales share of 71.81%. 'The Hate U Give' didn't do as well, with 43%, which was still better than the 33% for 'American Renegades'. 'First Man' also topped the UHD sales share chart, with an impressive 23.74%. For 'The Hate U Give', its UHD sales share was 4.74%. The stats for the week ending January 27, 2018 are as follows. Some small adjustments to the data posted last year (based on more recent updates) have been made and are shown below. Blu-ray sales decreased by $1.72m (down 7.5%), with unit sales down 7.6%. DVD sales decreased by $8.83m (down 24.5%), with unit sales down 22.4%. This meant $10.55 million less in combined revenue for the week. Blu-ray's market share increased from 38.94% to 43.87%. Blu-ray sales improved slightly thanks to a slew of new releases, including every title in the Blu-ray top 3. The Nutcracker and the Four Realms topped the sales charts, easily beating Blu-ray only release Reign of the Supermen. Hunter Killer was only slightly behind 'Reign of Supermen' in third place. The first time re-release of Willow by Disney, following their takeover of Lucasfilm, was 7th, while the 2018 remake of Suspiria was 10th (and was also a Blu-ray only release). Outside of the top 10, Doctor Who: The Complete Eleventh Series was 17th, while Indivisible finished in 18th place. This week's Ultra HD Blu-ray report: All of the titles in the top 3, 'The Nutcracker and the Four Realms', 'Reign of the Supermen' and 'Hunter Killer', were available on UHD. 7 titles out of this week's top 10 had UHD editions. No surprise that re-release 'Willow' had the best BD sales share out of the previously mentioned titles, with 91.74%. 'The Nutcracker and the Four Realms' managed to get 72%, while 'Hunter Killer' got 57.26%. Further down the list, 'Doctor Who: The Complete Eleventh Series' managed 49.07%, while 'Indivisible' got 34.05%. For the UHD sales share, it was actually 'Hunter Killer' that had the best result, with 11.70%. 'Reign of the Supermen' followed with 10.52% while 'The Nutcracker and the Four Realms' managed 8.04%. The stats for the week ending February 3, 2018 are as follows. Some small adjustments to the data posted last year (based on more recent updates) have been made and are shown below. Blu-ray sales increased by $3.93m (up 21.4%), with unit sales up 15.6%. DVD sales decreased by $8.85m (down 23.3%), with unit sales down 22.1%. This meant $4.92 million less in combined revenue for the week. Blu-ray's market share increased from 32.61% to 43.37%. Both Blu-ray and DVD revenue rose slightly compared to the last week, but weekly Blu-ray market share remains largely unchanged. The rise in disc revenue was largely due to the release of this week's top seller, The Grinch. It easily outsold the number two title, also a new release, Widows. Close behind in third place was The Girl in the Spider’s Web. That was it for new releases, not only in the top 10 but also within the entire top 20. This week's Ultra HD Blu-ray report: Both 'The Grinch' and 'Widows' were made available on UHD. 9 titles out of this week's top 10 had UHD editions, all except for new release "The Girl in the Spider's Web". 'The Grinch' had the best BD sales share out of this week's other two new releases. It managed a BD sales share of 63.44%. "The Girl in the Spider's Web" got 61.53%, while 'Widows' was further behind at 50.90%. A rare treat this week in that 'The Grinch' also had a 3D version, but with only a 0.78% 3D sales share (less than 8 3D sales per 1,000 disc sales), it's no surprise why it has become so rare for titles to be released in 3D. For UHD sales share results, 'Widows' actually did better than 'The Grinch', 9.51% versus 5.82%. The stats for the week ending February 10, 2018 are as follows. Some small adjustments to the data posted last year (based on more recent updates) have been made and are shown below. Blu-ray sales increased by $4.94m (up 23.9%), with unit sales up 20.3%. DVD sales decreased by $7.55m (down 18.2%), with unit sales down 20.7%. This meant $2.61 million less in combined revenue for the week. Blu-ray's market share increased from 33.24% to 43.00%. A big A-list release helped Blu-ray revenue rise almost $10 million compared to the previous week. That release was Bohemian Rhapsody, which was so popular that it beat last week's number one, 'The Grinch', but almost a 4-to-1 margin. With such a big release arriving in the week, it's common for other releases to avoid the week, and as such, the only other new release in the top 20 was Nobody's Fool. This week's Ultra HD Blu-ray report: Only 'Bohemian Rhapsody' was made available on UHD. 8 titles out of this week's top 10 had UHD editions. 'Bohemian Rhapsody' topped the BD sales share chart with 73.26%. All the way at 20th on the BD sales share chart was this week's other new release, "Nobody's Fool", with a BD sales share of 36.97%. 'Bohemian Rhapsody' sold well on 4K, with an Ultra HD Blu-ray sales share of 13.30%. The stats for the week ending February 17, 2018 are as follows. Some small adjustments to the data posted last year (based on more recent updates) have been made and are shown below. Blu-ray sales increased by $10.43m (up 42%), with unit sales up 33%. DVD sales decreased by $6.89m (down 15%), with unit sales down 19.8%. This meant $3.54 million more in combined revenue for the week. Blu-ray's market share increased from 35.08% to 47.44%. Another big release and Blu-ray sales hovered above the $30 million mark for the second week in succession. That big release was, of course, A Star is Born, which easily outsold last week's number one, 'Bohemian Rhapsody', by a considerable margin. There were a couple of other releases, like Robin Hood in 3rd place, and Overlord in 4th, but these could barely compare to this week's top release. Another new release, Backtrace, finished outside of the top 10 at 16th. This week's Ultra HD Blu-ray report: Only 'Backtrace' skipped on providing a UHD release this week. 9 titles out of this week's top 10 had UHD editions. It was 'Overlord' that had the week's best BD sales share, topping the chart with 71.70%. 'Robin Hood' was next best with 61.11%, while top-seller 'A Star Is Born' managed 53.10%. On UHD, 'Overlord' reigned supreme with a UHD sales share of 17.86% (meaning 24.9% - 17.86 divided by 71.70 - of all Blu-ray editions sold contained the UHD edition), followed by 'Robin Hood' with 12.45% (20.4% of all Blu-ray sales) and then 'A Star Is Born' with 7.71% (14.5% of all Blu-ray sales). The stats for the week ending February 24, 2018 are as follows. Some small adjustments to the data posted last year (based on more recent updates) have been made and are shown below. Blu-ray sales increased by $8.06m (up 32.6%), with unit sales up 21.6%. DVD sales decreased by $10.54m (down 21.4%), with unit sales down 26.1%. This meant $2.48 million less in combined revenue for the week. Blu-ray's market share increased from 33.43% to 45.86%. A big release and several big (Blu-ray only) re-releases helped Blu-ray revenue push above the $40 million mark, and helped weekly Blu-ray market share cross over the 50% threshold. Ralph Breaks the Internet did more than $200 million at the box office and definitely counts as a big release. It easily outsold everything else this week, including the re-release (on Blu-ray and 4K) of The Little Mermaid. Also coming to 4K for the first time, and this time via a different studio is Captain America: The First Avenger, which came in 8th place. Those who follow the Marvel Cinematic Universe will know that the first Captain America movie was released by Paramount before Disney gobbled everything up - it's now Disney's turn to re-release this film as a ''Cinematic Universe Edition", and also available for the first time in 4K. In 9th place was another new release, Mary Queen of Scots, while outside the top 10 saw Between Worlds finish in 11th place and The Possession of Hannah Grace finish 13th. This week's Ultra HD Blu-ray report: 'Ralph Breaks the Internet', 'The Little Mermaid', 'Captain America: The First Avenger', and 'Mary Queen of Scots' were all available on UHD. Every single title out of this week's top 10 had UHD editions! 'Ralph Breaks the Internet' did well on Blu-ray, with a first week Blu-ray sales share of 79.09%. 'Mary Queen of Scots' managed 68.48%, while 'Between Worlds' failed to get over 50% with 48.05%. 'The Possession of Hannah Grace' got 42.51%. All the other new releases were Blu-ray only releases. On UHD, 'Captain America: The First Avenger' had a huge 4K sales share of 85.87% (meaning almost every copy sold this week was for the 4K edition), while 'The Little Mermaid' had to settle for a UHD sales share of 21.32% (which is still not bad, but perhaps not as good as a 4K re-release was expected to be). 'Mary Queen of Scots' got a UHD sales share of 10.7% while this week's top seller, 'Ralph Breaks the Internet', managed 8.35%. The stats for the week ending March 3, 2018 are as follows. Some small adjustments to the data posted last year (based on more recent updates) have been made and are shown below. Despite this week's big releases and re-releases, almost every metric below was still in red due to the fact that this time last year was when the big Disney release 'Coco' and re-release 'Lady and the Tramp: Signature Collection' was made available on Blu-ray. Blu-ray sales decreased by $5.27m (down 10.9%), with unit sales down 11.9%. DVD sales decreased by $12.4m (down 22.4%), with unit sales down 23.9%. This meant $17.67 million less in combined revenue for the week. Blu-ray's market share increased from 46.63% to 50.08%. Blu-ray revenue dropped back below the $40 million dollar mark again, after sales of last week's top seller, 'Ralph Breaks the Internet', dropped back down. But it still sold enough to retain the top spot. Creed II was this week's big release, but it didn't sell enough copies to knock 'Ralph' off top spot. In fifth place was another new release, Instant Family. Oscar favourite The Favourite was the next new release in 8th place, while The Vanishing rounded off the top 10, in 10th place. Outside of the top 10, Ben Is Back finished in 14th. This week's Ultra HD Blu-ray report: Despite the numerous new releases, only 'Creed II' was made available on UHD. 7 out of this week's top 10 had UHD editions. Of all the new releases mentioned above, 'The Favourite' actually had the best BD sales share, 55.26%. It was just above the sales share for 'Creed II', 53.41%. Now below the 50% mark, 'The Vanishing' got 48.60%, while 'Instant Family' managed 45.41%. And in 20th place was 'Ben Is Back' with 31.47%. For the week's sole UHD release in the top 20, 'Creed II', it managed a UHD sales share of 10.93%. The stats for the week ending March 10, 2018 are as follows. Some small adjustments to the data posted last year (based on more recent updates) have been made and are shown below. None of this week's releases could match the huge release from this time last year, 'Thor: Ragnarok'. Which is why we have an all red week where every metric below compares negatively to the same week last year. Blu-ray sales decreased by $26.27m (down 45.1%), with unit sales down 40.8%. DVD sales decreased by $13.65m (down 25.1%), with unit sales down 24.8%. This meant $39.92 million less in combined revenue for the week. Blu-ray's market share decreased from 51.71% to 43.98%. Another big release this week, but it failed to take Blu-ray revenue above the $40 million dollar mark despite Blu-ray sales rising compared to the previous week. Fantastic Beasts: The Crimes of Grindelwald was that big release, but a U.S. box office taking of $159.56 million just wasn't big enough to make a huge difference on Blu-ray it seems. It did help the first 'Fantastic Beasts' movie to make a return to the top 10, at 10th place. Still, it did a lot better on Blu-ray than the second placed (and also new) Mortal Engines. Controversial Oscar Best Picture winner Green Book was the next new release in 4th. And that was actually it in terms of new releases, not only in the top 10 but in the entire top 20. This week's Ultra HD Blu-ray report: All three of the previously above mentioned new releases were made available on UHD. 9 out of this week's top 10 had UHD editions. 'Fantastic Beasts: The Crimes of Grindelwald' had the best BD sales share out of all releases this week, with a BD sales share of 67.16%. It was only slightly above 'Mortal Engines', which got 66.45%. 'Green Book' managed to get 52.12%. 'Fantastic Beasts: The Crimes of Grindelwald' was also available on 3D, but it fared no better than the other recent 3D releases, with a 3D sales share of only 0.94%. On UHD, it was 'Mortal Engines' that did the best, with a UHD sales share of 14.00%. 'Fantastic Beasts: The Crimes of Grindelwald' got 11.30%, while 'Green Book' had 7.48%. The stats for the week ending March 17, 2018 are as follows. Some small adjustments to the data posted last year (based on more recent updates) have been made and are shown below. Another all red week where every metric below compares negatively to the same week last year, and this time it was due to the release of 'Justice League' last year (which was twice as big in U.S. box office than this week's top seller, 'Fantastic Beasts: The Crimes of Grindelwald', although both had a similar total box office when international ticket sales are accounted for). Blu-ray sales decreased by $16.55m (down 35.8%), with unit sales down 33.9%. DVD sales decreased by $13.65m (down 29.9%), with unit sales down 29.2%. This meant $30.2 million less in combined revenue for the week. Blu-ray's market share decreased from 51.40% to 49.21%. 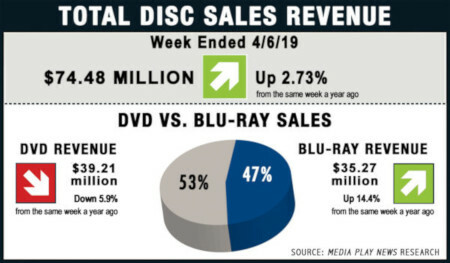 Not one, but two big movie releases helped to push Blu-ray revenue above the $40 million dollar mark again and helped weekly Blu-ray market share reach one of its highest points ever. Nearly 56% of all disc sales belong to Blu-ray and Ultra HD Blu-ray standalone or combo packages, and that was largely thanks to this week's number one and two releases, Spider-Man: Into the Spider-Verse and Mary Poppins Returns. The two top sellers were neck and neck in terms of units sold, and selling way above anything else this week, including last week's number one, 'Fantastic Beasts: The Crimes of Grindelwald'. There were three other new releases, but they only sold enough copies to get into the combined Blu-ray and DVD top 20, not the Blu-ray top 20. There was Big Kill in 14th, The Final Wish in 18th and The Quake in 20th place. This week's Ultra HD Blu-ray report: Only the top two sellers, 'Spider-Man: Into the Spider-Verse' and 'Mary Poppins Returns', had Ultra HD Blu-ray editions. Thanks to this week's top two releases, every single title in the top 10 had an UHD edition. While 'Spider-Man' may have won the sales war, it was 'Mary Poppins Returns' that had the higher BD sales share, with a massive 78.38% of buyers opting for the Blu-ray or UHD combo editions (with only 21.62% buying the DVD only edition). To be fair, 'Spider-Man: Into the Spider-Verse' wasn't far behind either, with a BD sales share of 78.01%. 'The Quake' got 34.10%, which probably explains why it didn't get into the Blu-ray top 20. The same for 'Big Kill' (25.26%) and 'The Final Wish' (24.59%). On UHD, the gorgeous visuals on 'Spider-Man: Into the Spider-Verse' helped it to easily beat 'Mary Poppins Returns' in UHD sales share, with 16.33% compared to "just" 8.27%. The stats for the week ending March 24, 2018 are as follows. Some small adjustments to the data posted last year (based on more recent updates) have been made and are shown below. Almost another all red week where every metric below compares negatively to the same week last year, but this time, higher weekly Blu-ray market share helped to save the day. 'Jumanji: Welcome to the Jungle' was released this time last year, and that was almost a billion-dollar movie, bigger than this week's top two releases combined. Blu-ray sales decreased by $6.65m (down 13.5%), with unit sales down 20.2%. DVD sales decreased by $20.67m (down 36.1%), with unit sales down 34.3%. This meant $27.32 million less in combined revenue for the week. Blu-ray's market share increased from 46.25% to 55.82%. Another big release this week in the form of Aquaman, which helped Blu-ray revenue stay above the $40 million dollar mark. Weekly Blu-ray market share stayed above the 50% mark again and was only down slightly due to an increase in DVD sales. 'Aquaman' outsold 'Spider-Man: Into the Spider-Verse' by quite a big margin, and it was an even bigger margin between 'Aquaman' and the next best selling new release, My Hero Academia: Two Heroes in 5th place. The 30th-anniversary edition of Pet Sematary, released on UHD for the first time, re-entered the top 100 at 8th. In 9th place was another new release, Second Act. And finally in 14th place was the last new release in the top 20, If Beale Street Could Talk in 14th. This week's Ultra HD Blu-ray report: 'Aquaman' and 'Pet Sematary' both had UHD editions, with the other new releases missing out. 8 out of this week's top 10 had a UHD edition. It was 'My Hero Academia: Two Heroes' that topped the BD sales share chart with a BD sales share of 87.38%. Top seller 'Aquaman' managed 66.32%. 'If Beale Street Could Talk' got 46.21%, while 'Second Act' got 45.12%. 'Aquaman' was also available on 3D, and it got a 3D sales share of 1.06%, which is not great but still better than most of the other recent 3D releases. For UHD sales share, 'Pet Sematary' got an impressive 38.75%, while 'Aquaman' got 14.23%, which is not too bad. The stats for the week ending March 31, 2018 are as follows. Some small adjustments to the data posted last year (based on more recent updates) have been made and are shown below. Despite the big release this week, there was an even bigger release this time last year in the form of 'Star Wars: Episode VIII - The Last Jedi'. So it's another inevitable all red week where every metric below compares negatively to the same week last year. Blu-ray sales decreased by $31.96m (down 42.3%), with unit sales down 44.2%. DVD sales decreased by $23.81m (down 37.5%), with unit sales down 40.5%. This meant $55.77 million less in combined revenue for the week. Blu-ray's market share decreased from 54.34% to 52.35%. Two big-ish, but not quite A-list, releases this week meant that Blu-ray revenue dropped below $40 million dollars but did not fall below $30 million. This week's top-selling new release and this week's overall top seller was Bumblebee. In third place was the next new release, The Mule, although it only sold a fraction of the numbers of copies of 'Bumblebee'. Vice was in 7th, while there were three new releases outside of the top 10. These were Dragon Ball Super: Part 7 in 13th, A Silent Voice: The Movie in 14th and The Man Who Killed Hitler and Then The Bigfoot in 17th. This week's Ultra HD Blu-ray report: 'Bumblebee' and 'The Mule' both had UHD editions, with the other new releases choosing not to go 4K. 8 out of this week's top 10 had a UHD edition. In terms of BD sales share, it was actually 'A Silent Voice: The Movie' that did the best, not only out of this week's new releases but also out of all titles. 'A Silent Voice: The Movie' got 95.52%. 'Dragon Ball Super: Part 7' was the next best with 76.31%. Top seller 'Bumblebee' managed 65.01%, while 'Vice' got 54.17%. Both 'The Mule' and 'The Man Who Killed Hitler and Then The Bigfoot' got 40% which is kind of disappointing especially for 'The Mule'. For the two UHD new releases, 'Bumblebee' had a UHD sales share of 14.49% while 'The Mule' got 5.61%. The stats for the week ending April 7, 2018 are as follows. Some small adjustments to the data posted last year (based on more recent updates) have been made and are shown below. Blu-ray sales decreased by $4.44m (up 14.4%), with unit sales up 10.7%. DVD sales decreased by $2.46m (down 5.9%), with unit sales down 14.6%. This meant $1.98 million more in combined revenue for the week. Blu-ray's market share increased from 42.52% to 47.35%.